Tooth decay and gum disease are too common in American society. 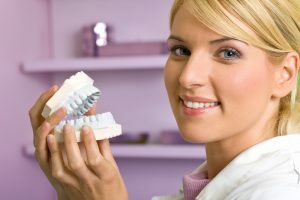 Fortunately, you can lower your risks by following a few basic tips from a dentist in West Monroe. Brushing and flossing, eating a sensible diet, and avoiding tobacco products are important steps to take. Science tells us that there are more than five million trillion trillion bacterium in the world. That’s a five followed by 30 zeroes, a number that’s almost too large to imagine. The good news is that most of these microscopic lifeforms are harmless to humans. In fact, many types of bacteria are actually beneficial. They help us to digest our food and to maintain an even emotional keel. Harmful bacteria build up on the surfaces of your teeth, looking for weaknesses in the enamel that protects them. When they find a chink in the armor, they spread into the tooth’s inner layers, secreting acids that attack the tissue and promote decay. These invisible enemies thrive on the sugars and starches in your daily diet, which is why your dentist urges you to limit your consumption of these foods. These invaders work their way into the vulnerable nerves and connective tissue at the root of the tooth. This causes severe pain for the sufferer. Left untreated, the infection can spread into the bones that make up the jaw, setting the victim up for a lifetime of serious health problems. No treatment can remove these dangerous bacteria from your mouth forever. That’s why it’s so important to brush and floss every day. But self-care by itself isn’t enough. You also need cleanings and checkups from your dentist’s office. An extracted tooth leaves behind an empty socket, one with living nerves and tissues buried deep inside. This means that sometimes the discomfort can continue even after the extraction is complete. Your teeth are a team. Losing one of them weakens all of them. Even a single missing tooth can cause others to eventually fail. A missing tooth causes more than physical problems. It can impact your self-esteem and impair your ability to carry on social and personal interactions. Dental crowns. A crown is a restoration that sits atop the base of the tooth and protects it from further damage. Dental bridges. As its name implies, a bridge is a restoration that spans the gap over a missing tooth, enhancing the patient’s smile and restoring lost functionality. An implant is the closest possible thing to a re-created natural tooth. It offers the ultimate in dental restoration. Implant-supported dentures. This is a hybrid form of treatment that combines a pair of implants with a specially crafted denture plate. Many patients consider it the best of both worlds. Tooth decay can happen to anyone. But modern dentistry has options that can protect what you’ve got and restore what you’ve lost. Talk to your dentist soon about the treatments that are available. You’ll soon have lots of reason to smile. Dr. L. King Scott has been practicing dentistry for over 30 years. He is a recipient of the Lifelong Service and Recognition Award from the Academy of General Dentistry, one of the profession’s most prestigious awards. You can reach Dr, Scott’s office online or by calling (318) 325-4600.